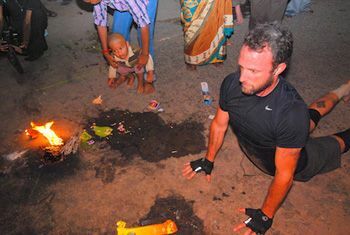 In late 2012, yoga teacher Josh Schrei raised nearly $11,000 for clean water advocacy by pledging to do 3,000 sun salutes around the sacred Arunachala mountain in South India. Regardless of how common such a feat like might seem to the locals in India, here in the US, Josh notes, “if you say, ‘I’m going to do 3,000 sun salutes, people think you’re kind of nuts.” We caught up again with Josh to get his insights into advocacy-fueled pilgrimage, how water relates to yoga, and tips for traveling healthier—and happier—anywhere in the world. Why is something like clean water advocacy close to your heart? I wanted to work on a cause that is physically and spiritually relevant to all human beings on the planet. Water is fundamental to life. Not just to a certain group over here, or a certain group over there, it’s relevant to everyone. I think of it as a great common denominator for all humanity. When we really look at the human condition, we see vast inequality. We have people on one end of the spectrum who have everything they need, and they’re dying from diseases related to over-consumption. Then we have people on the other end who are dying from diseases related to lack. Specifically—lack of access to clean water kills more people than conflict or war. In India, millions of people die every year because they don’t have access to clean water. One way we can make things a little more equal and promote loving kindness is bring clean water into more communities all over the world. Especially in the coming years, we’re going to be facing a lot of shortage so it’s best to start addressing it… yesterday (laughs). How do you think all this relates to yoga? There’s a very deep relationship between water and yoga and it relates on all levels from the cosmic to the practical. When we talk about things we’re holding in our hearts, for example, we often use the analogy of water… that things aren’t flowing quite right. And when we really start to look at the motion of energy and how prana works, it’s very much associated with water. Why did you choose the Arunachala Mountain out of any number of sacred places in India? Arunachala, in the Shiva cosmology, is the mountain of fire. Shiva is a transformative fire and has five elemental temples to him in South India; Arunachala is the place where he manifests the element of fire. It’s an incredible place—a place I’d been as a child… I was there when I was 13. And in the teachings of yoga on tapas, there’s this great relationship between water and fire, which we also find reflected in the energy channels of the human body. 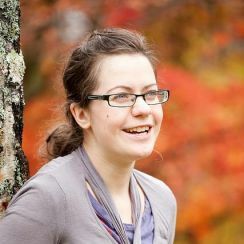 For some reason, the idea of doing a transformative practice around the mountain of fire in order to bring water to people seemed like a good thing to do (laughs). On very practical terms, I was going to be in South India anyway. I knew I wanted to do a campaign for water.org and it just came to me one day. I also have tremendous respect for the tradition of parikrama—the tradition of circumambulation. What were the months of preparation like? As far as training, I do my yoga practice. I also live in the mountains and spend a lot of time running… I have a yoga instructor/outdoor fitness wizard whom I work with, who is an absolute madman. He’s 50 years old and he still competes in 5 different outdoor sports and comes in the top 10 basically every time he competes. He’s incredible. He designs outdoor training programs that really make use of the principles of yoga, pranayama, and asana. But I’ll say the number one form of training is to practice ahimsa [non-harming] and surrender. When I got to South India, the whole thing was joyous. It wasn’t “Oh my god I have to do another sun salute” (laughs). Sure, sometimes things were tough, but it was joyous, because I was there to adore the mountain and to bring some water to people who were thirsty. Was there any uncertainty, unexpected circumstances? X-factors that I didn’t anticipate? Yeah. There are two roads around Arunachala: the inner path—a nice quiet forest path where I had been intending to do my sun salutes—and the outer path, the main pilgrimage route that’s a lot noisier, with animals and vehicles. The culture in India speaks the language of devotion in a way that’s hard to explain. When they see someone in an act of devotion, it speaks to their heart and they return that energy with lots of smiles and laughter and love. When I got there, the inner path was closed. They had just shut it down the week before. But actually that ended up being a blessing. I had a lot more interaction with people, and the support that I got from them was immense. The culture in India speaks the language of devotion in a way that’s hard to explain over here. When they see someone in an act of devotion, it speaks to their heart and they return that energy with lots of smiles and laughter and love. I also didn’t anticipate how hot it was going to be. It was at least 10 degrees hotter than I expected—the first day was like 95 degrees. So that was a challenge. I had intended to go all through the day, but I actually ended up staggering morning and evening because the middle of the day was just too hot. The pilgrimage sidewalk was too hot to even put your hands on. So I adjusted a bit. I ended up doing it over three days total. I did 750 sun salutations the first day, 1200 the second day, and 1050 the third day. How did you stay healthy? By praying (laughs). That might not sound practical, but that’s how I stayed healthy. I was doing sun salutes facedown in the dirt, in cow dung, and dodging monkey droppings 3,000 times. I did it barefoot, with ankle bracelets on. But, I didn’t get a single blister or break the skin on my feet or anything. I was totally blessed. On a practical level, because I do a lot of endurance running up in the mountains, I have a pretty good sense of the line between when I’m right in the zone and where I’m pushing beyond where I should push—something that we all face on our yoga mats every day. That really kept me injury-free. The first day the risk of heat exhaustion was high, because it was 95 and I was pushing it a little bit. I recognized that and backed off some. That is what we should be doing with our practice all the time. Do you have other tips for healthier travel? The number one tool we’re given in this life is our breath. I do a lot of pranayama when I’m traveling on a plane. It helps a lot. I also go in the back and sneak in a couple of triangle poses and uttanasana. Attitude is part of it, too. You have to be open. In India, if you try to come with a full-on agenda, with no flexibility, you’ll probably encounter a few obstacles and those obstacles can create stressful situations and get you sick. And then it’s as simple as: just don’t eat salad. (Laughs.) A lot of people go to restaurants that cater to westerners. And that’s the number one way people get sick, by thinking “oh, it’s probably safe.” Be careful. What’s the first step you’d recommend for a yoga teacher who wants to do the same kind of thing? Choose a cause very close to your heart—that’s the most important part. That ensures that whatever work you do for it is work you really deeply want to be doing. Sometimes we jump into cause-related stuff because we feel like we should. Or because someone else suggested it. Choosing from our hearts… The rest will flow from there. That said there are a lot of organizations within the yoga world that help people direct their charity efforts. I really love the practice of pilgrimage as a way to raise funds and awareness and to include other people. I am definitely going to keep working with (and for) water.org. And keep coming up with ways to include the yoga community. I really love the practice of pilgrimage as a way to raise funds and awareness and to include other people. The only problem? Obviously not everyone can do 3,000 sun salutes! So I’m kind of looking into a pilgrimage that can be more inclusive, one that other people can participate in. I’ll keep you posted.